I wrote last week about EMF measurements. 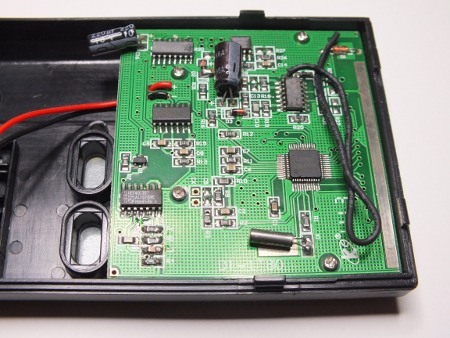 Here is more information on the DT-1180 2.3″ LCD Screen Electromagnetic Radiation Detector I used for electrical field measurements. DT-1180 2.3″ LCD Screen Electromagnetic Radiation Detector is a meter designed for electric fields and RF field measurements. 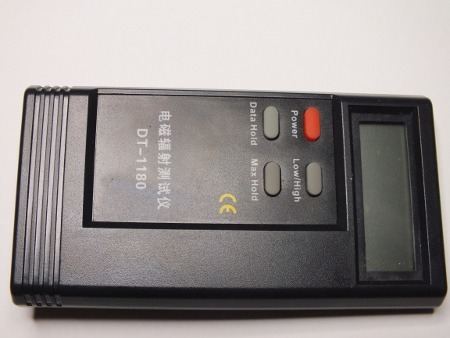 DT-1180 2.3″ LCD Screen Electromagnetic Radiation Detector measures low frequency electrical fields (5Hz~400KHz) in V/m and high frequency RF fields (30MHz~2000MHz) uW/cm2. The measurement accuracy is said to be 1V/m and 1uW/cm2. This was not the cheapest field meter around, but this meter was different from many other in that it displays the results in some unit that makes sense and are comparable to something. Many other cheaper meters seemed to have a digital display that gives just some some number without unit. Measurements that give have a sensible unit in them are much more useful. The numbers that the electrical field measurement gives seem to make sense. For electrical fields the measurements below high voltage line the meter gives results that would be expected at that location (I got 1439 V/m, according to literature a typical values to expect would be 1000-2000 V/m). Also some other measurement on home and office environment seemed to give results comparable to values given on literature. For RF fields I found that the meter reacted to mobile phone signal and a walkie-talkie radio transmitting nearby. I have not been able to do comparison to some other meter to get idea how accurate the results are at different frequencies. This looks pretty normal small electronics measurement device. It seems that the case has been designed for some other devices originally, because the case has extra holes for buttons that are not used on this device. Here is one closer look at the circuit board. I thinks that the black insulated wire you see on the right is the sensor used for detecting electrical field. 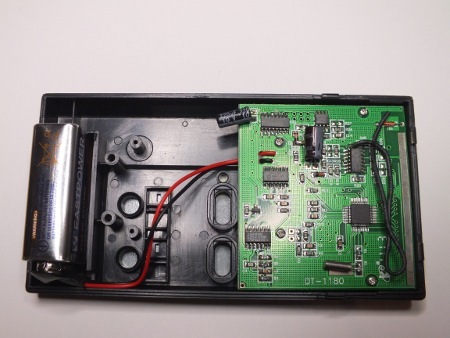 electric field meter can be build from two sensor plates (I quess here a wire and circuit board ground plane), a rectifier circuit and a digital multimeter circuit after it. Right from it there is silver line on the circuit board, and it looks like it could be the antenna for receiving RF signals. RF field meter consists of suitable wide-band antenna, a RF signal rectifier and digital multimeter circuitry. If you want to measure the electric field around objects, this meter will do it. It measure Volts/Meter. If you have a high electric field, this meter will tell you. The meter will also give you information on RF field strength. The DT-1180 meter RF signal measurement range is said to be in specifications to be 30MHz~2000MHz. I found out that it reacts also to 2.4 GHz signal microwave oven leakage signal. I don’t know how accurate the meter is at that frequency. Czule zapraszamy na ekskluzywną witrynę zadedykowaną kwestii Informatyki. Odnajdziesz na niej najnowsze komentarze z zagranicy. Ta ogromna witryna zszokuje Twoją rodzinę płynnością tekstów. Pisarze codziennie walczą o jakość wypowiedzi. Blog już w tym momencie raduje się przeogromną używalnością w gronie dorosłych. The electromagnetic fields from power lines and mobile phones are not, in fact, likely to be harmful to humans, according to new research from scientists at the University of Manchester. While prior studies have never proven any link between the radiated emissions from power lines and cellphones and any effects on human health, they could not entirely rule out the possibility. The FCC adopted limits for Maximum Permissible Exposure (MPE) are generally based on recommended exposure guidelines published by the National Council on Radiation Protection and Measurements (NCRP) in “Biological Effects and Exposure Criteria for Radiofrequency Electromagnetic Fields,” (NCRP, 1986). EMF Exposure Guidelines in Canada are under the jurisdiction of Health Canada who has not independently established guidelines for magnetic field or electric field exposure. When pressed, they will state that Canada follows the International Commission on Non-Ionizing Radiation Protection “ICNIRP” guidelines of 830 mG or 83,000 nT (Magnetic Field) or 5000 V/m (Electric Field) for a 24-hr period. Radio Frequency “RF” Exposure Guidelines in Canada, are under the jurisdiction of Health Canada who has developed and established Safety Code 6 to offer federal guidelines for safe Radio Frequency Wave exposure levels. These limits are in the range of 2,000,000 to 10,000,000 microwatts per square meter and are based solely on the short term thermal effects or the heating of body tissue. The FCC regulations do not require field-strength measurements. Measurements are one way to perform an analysis, but they’re very tricky. With calibrated equipment and skilled measuring techniques, ±2 dB error is pretty good. In untrained hands, errors exceeding 10 dB are likely. A ham who elects to make measurements will need calibrated equipment (including probes) and knowledge of its use. Many factors can confound measurements in the near field. Most evaluations will be comparisons against typical charts to be developed by the FCC, relatively straightforward calculations of worst-case scenarios or computer modeling of near-field signal strength. The FCC encourages flexibility in the analysis, and will accept any technically valid approach. Once an Amateur Radio operator determines that a station complies, operation may proceed.